As new technologies become available, scientists are learning more than ever before about the structure and properties of the Earth's crust and upper mantle -- bringing them to the brink of discoveries about earthquakes that could one day save millions of lives. The U.S. Geological Survey estimates that several million barely perceptible earthquakes happen every day, while larger, cataclysmic quakes routinely cause devastation. 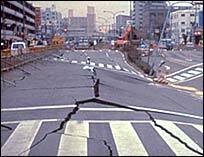 Read about what scientists now know about why earthquakes happen. The Earth's surface is made up of giant slabs of rock, or tectonic plates, that move at an average of several inches per year, and are the underlying cause of earthquakes. View an interactive map of the major tectonic plates. Scientists are hoping that an observatory they plan to submerge in one of the world's most active faults, California's San Andreas Fault, will help yield answers to the causes of earthquakes and other questions that have perplexed them for decades. As scientists gain more knowledge of earthquakes, engineering principles have led to more earthquake-resistant construction. Combined with strict building codes, these techniques curtail the destruction when a major earthquake hits. Dr. William Ellsworth, a leading researcher on understanding the earthquake cycle, answers your questions on earthquakes and the science of earthquake prediction. do not necessarily reflect the views of the NSF.